The old saying goes "less is more". When talking about airflow restriction within dryer ducts, this is especially true. 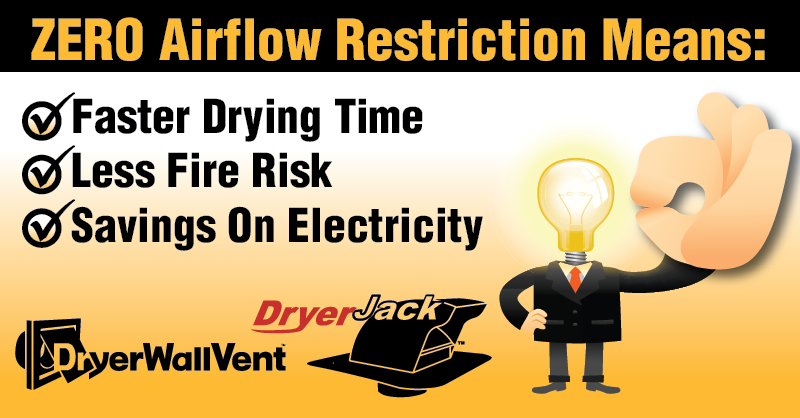 One of the goals for the makers of DryerWallVent and DryerJack is to design a dryer duct system that shoots for zero airflow restriction. This helps to ensure that lint isn't trapped and, in turn, helps to prevent fires. The side effect of this type of design is that it eliminates some of your drying time. The added bonus? Less drying time equals less electricity used, so you save money on your electric bill.